The Development and Training System (DTS) is experiencing intermittent issues and is currently unavailable. Technicians are working to resolve the issue but there is currently no estimate for full restoration of service. System Status on www.csuchico.edu/itss will be updated when DTS is back online. One of the most serious cyber-security risks facing the campus today comes from phishing email messages. Phishing is the use of email messages in an attempt by hackers and cybercriminals to steal personal information or hijack computing resources for nefarious purposes including fraud and identity theft. When employees and students are tricked into giving up their user name and password, the criminals may gain access to even the most secure system. 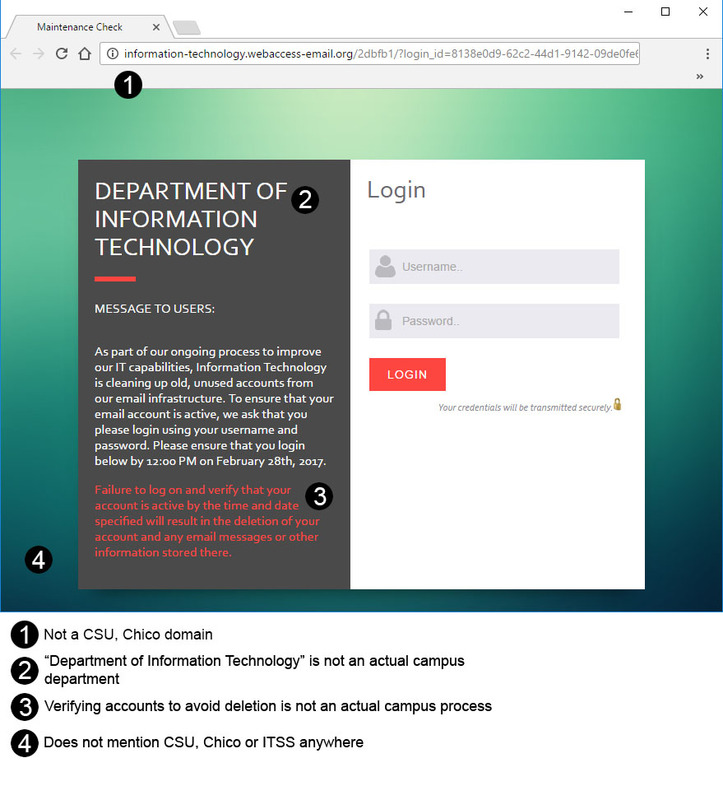 To help reduce the chance that this happens, CSU, Chico is about to begin a training program that is intended to help the campus community recognize and ignore email phishing messages. 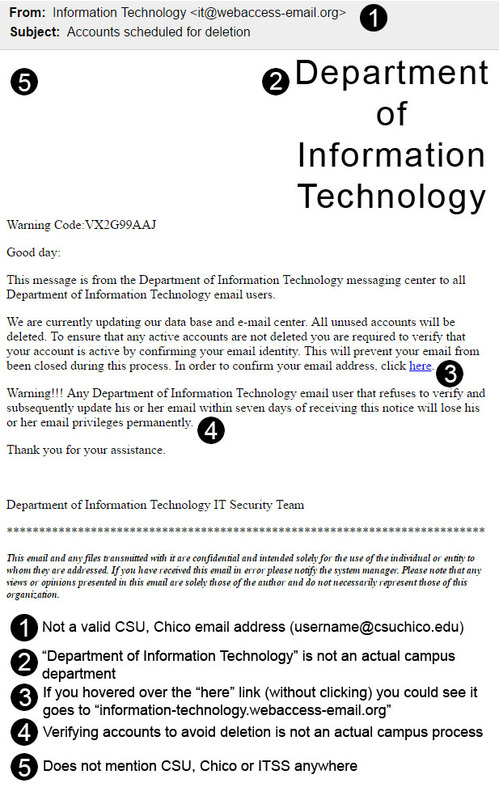 More than 3,000 CSU, Chico email accounts have been compromised in the last 6 months due to successful phishing attacks. 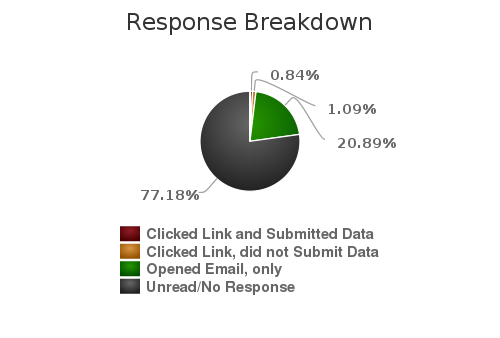 92% of all breaches start with a successful phishing email. You may have received a few general phishing emails at home, but did you know the same technique is used by sophisticated criminals to compromise companies and organizations? Everyone with an email address is a potential target for phishing. The campus will continue to make improvements to security technology, but the best defense against these attacks isn’t just technology, its learning how to spot and report phishing. During this awareness training program, you will receive emails that mimic the phishing emails that target our organization. The purpose of these emails is to give you hands-on experience in what a phishing email looks like. If you suspect an email is a phishing attack you should delete it. Do not click on links or open attachments in a suspicious email. If you do fall prey to one of the simulated phishing attacks, you’ll instantly see that it was just a training exercise, along with some education material about how to improve at identifying phishing. This is an attempt to help protect student and employee privacy and confidentiality, not to trick you. The results of this campaign will be kept confidential. Even though our education will be focused on phishing at work, the tips you learn will better protect you at home from having your identity and/or financial account information stolen via phishing. The campus has recently been targeted by several social engineering attacks. Social engineering attacks utilize phone calls and emails to manipulate people into performing actions they should not do, such as using a web browser to visit an infected web site, installing software for purposes of providing “computer support,” or divulging confidential information. Many of today’s most common cyber-attacks are based on social engineering. As such, this module explains what social engineering is, how attackers fool people and what to look out for. We then demonstrate a common social engineering attack. We finish with how people can detect these attacks and how to respond to them. One of the primary means of hacking people is through email. Email is used for both simple, large-scale attacks and more targeted spearphishing attacks. We explain how these attacks work, including recent examples of phishing, spearphishing, malicious attachments and other email-based attacks. We then explain how these types of attacks work for almost any type of messaging technology. We then explain how to detect and stop these attacks. The Family Educational Rights and Privacy Act, also known as FERPA, is a federal law that protects the privacy of student education records. The law applies to all schools that receive funds from the U.S. Department of Education. This module explains the rules and regulations all school faculty, staff, contractors and student employees should follow when handling student information. This module is built on and requires people to watch the Data Security module first. On Saturday, November 14th, Skillsoft will be conducting network upgrades which will make Skillport, which includes the “Data Security & Privacy” and other training material, inaccessible to campus users. The time Skillport should be down will be minimal. The scheduled outage time is 6:00 PM and shouldn’t last longer than 30 minutes. Tomorrow, June 18, the CSU, in partnership with CSU, Chico, will complete a project to expand employee access to online training content offered by the CSU. During this time, the Development and Training System (DTS) will be offline, as well as our campus access to CSU SkillSoft e-courses while the necessary changes are applied in both systems. It is anticipated that both systems will be operational on June 19. No action is required of you. The campus DTS will resume communications regarding required training once the system is back online.